Tom N. Demos was 88 years old when he entered into eternal peace with God on March 8, 2018. He was born in Thisvi, Greece to parents Nicholas and Katerina Mastrodemos. He immigrated in 1951 to Lorain, Ohio. He was employed for 38 years by Ford Motor Company starting at the Lorain plant and then moving to Avon Lake. Longtime member of St. Nicholas Greek Orthodox Church in Lorain, Ohio; the Ahepa and Theveon Societies. In his free time, he enjoyed attending & volunteering at many church events, gardening and traveling to spend time with his grandchildren. 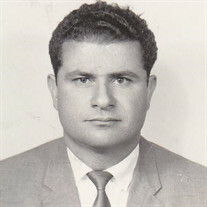 He leaves behind his wife of 57 years, Joanna; their son, Robert Demos; their daughter, Kathleen (Edward) Yoannides; and grandchildren, Jonathan Yoannides & Maximus Yoannides. From his previous marriage he has a son, Nicholas (Sharon) Demos; three grandchildren, Andrea Bullins, Rebecca Demos, Nate Demos and three great-grandchildren Elijah, Audrey and Brielle Bullins. He is survived by his brother, Haralambos in Greece, and many cousins and godchildren. Besides his parents, Tom was also preceded in death by his brother, Meletios. The family will receive friends on Saturday, March 17, 2018 from 10:00 am at St. Nicholas Greek Orthodox Church, 2000 Tower Blvd, Lorain, until the time of funeral services at 11:00 am. Rev. Protopresbyter Michael C. Gulgas, pastor will officiate. Burial will follow in Ridge Hill Memorial Park, Amherst, Twp. Memorial contributions can be made in his memory to St. Nicholas Greek Orthodox Church, 2000 Tower Blvd. Lorain, Ohio 44053. The Dovin Funeral and Cremation Specialists, 2701 Elyria Ave., Lorain, is handling the arrangements. To send online condolences go to www.dovinfcs.com.